URS is an independent energy management and procurement company that provides electric and gas procurement services to real estate owners and operators nationwide for all asset classes: multifamily, retail, commercial, office, industrial and hospitality. 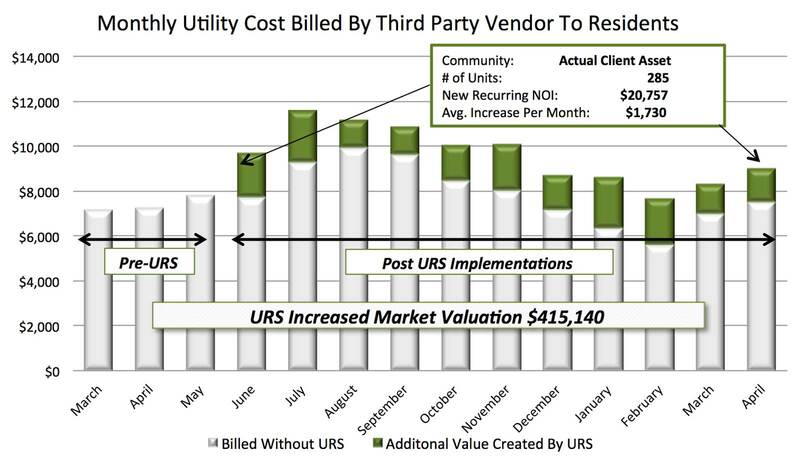 Who We Are: Utility Revenue Services (URS) specializes in revenue optimization for multifamily owners and operators by auditing not only how the utility providers bill your communities but also how the third party utility billing vendors bill your residents. URS is the only company in the country who performs this unique service objectively as we are not a billing company or an utility – we are an independent expert. Hard dollars…URS increases monthly recurring income by $7.00+ per door on average. URS has audited over 500,000 apartment units nationwide, and our clients have implemented recommendations that have increased their annual utility NOI by over $35 million dollars, creating more than $500 million in increased value at conservative cap rates. Our audits of the local utility districts servicing these communities have also generated hundreds of thousands of dollars in reimbursements to the communities due to incorrect or improper billing practices. We also corrected numerous billing compliance violations to eliminate legal exposure. Our services include a complete analysis of your water, sewer, gas and electric bills and optimization of how utilities are reallocated to residents. We perform a series of utility billing audits on a community-by-community basis to identify additional revenue opportunities, billing errors and legal compliance issues. We do not replace the services of your third party utility billing company, and we are not a traditional utility audit firm (which only audits the utility costs from the utility provider to the community). It is also important to note that URS identifies and corrects legal compliance issues on approximately 1 out of every 4 communities audited. We are performance-based. We are compensated only if we identify additional income and your company implements our recommendations. In summary, we confirm the local utility district is billing the community properly and that you are billing your residents as effectively and efficiently as allowed by law for utilities. Our analysis is completed and implemented without economic risk. We work nationally with large national multifamily owners and operators as well as smaller, regional companies. We pride ourselves on our client relationships and will provide specific references on request.